A new study published in the Journal of Experimental Biology titled, "Effects of field-realistic doses of glyphosate on honeybee appetitive behavior," establishes a link between the world's most popular herbicide – aka Roundup – and the dramatic decline in honeybee (Apis mellifera) populations in North American and Europe that lead to the coining of the term 'colony collapse disorder' (CCD) in late 2006 to describe the phenomena. The researchers found that concentrations of glyphosate (GLY) consistent with the type of exposures associated with standard spraying practices in GM agricultural- and neighboring eco- systems reduced the honeybee's sensitivity to nectar reward and impaired their learning abilities – two behavioral consequences likely to adversely affect their survival abilities. Moreover, while sub-lethal doses were not found to overtly affect their foraging behavior, they hypothesized that because of their resilience, "..forager bees could become a source of constant inflow of nectar with GLY traces that could then be distributed among nest mates, stored in the hive and have long- term negative consequences on colony performance." Roundup herbicide is a ubiquitous toxicant, with an accumulating body of research now showing it is a common contaminant in our air, water, rain, soil and food, and in physiologically relevant concentrations (even the part-per-trillion concentration range demonstrates endocrine disruptive and potentially carcinogenic properties) to microbial, insect, animal and human life. When Roundup herbicide was first evaluated for toxicity to the honeybee, the focus was on acute toxicity of the 'active ingredient' and not sub-lethal and prolonged exposure effects; and certainly not the amplified toxicological synergies present in glyphosate formulations like Roundup, which when the so-called 'inert' adjuvant ingredients (e.g. surfactants) are taken into account, have been found to be at least 125 times more toxic than glyphosate alone. By only taking into account acute toxicity – as measured by the so-called LD50 (lethal dose, 50%) – on the 'active' ingredient, government regulators approved glyphosate as relatively harmless to honeybees prematurely. "Glyphosate [GLY] toxicity tests on Apis mellifera for product approval did not consider sub-lethal nor prolonged exposure effects. Studies were only focused on obtaining LD50 (lethal dose, 50%) as a measure of the effect of an acute exposure, but nevertheless, they were carried out on the basis that honeybees might in fact be exposed to GLY in their natural environment, either through the consumption of contaminated resources or through a direct exposure as a result of inadvertent spraying (Giesy et al., 2000). Even though LD50 results seem to indicate that GLY is not harmful for honeybees, the fact that honeybees are potentially exposed to GLY motivated us to pursue further analysis and to address the lack of chronic studies." The authors of the new study set out to test whether doses of glyphosate bees would realistically encounter in the field (field-realistic doses) could affect their feeding behavior (appetitive behavior) in a deleterious manner. They exposed honeybees to field-realistic doses of glyphosate chronically and acutely, and observed: "a reduced sensitivity to sucrose and learning performance for the groups chronically exposed to GLY concentrations within the range of recommended doses," as well as significant decrease in elemental learning, non-elemental associative learning, and short-term memory retention, when exposed to acute GLY doses. 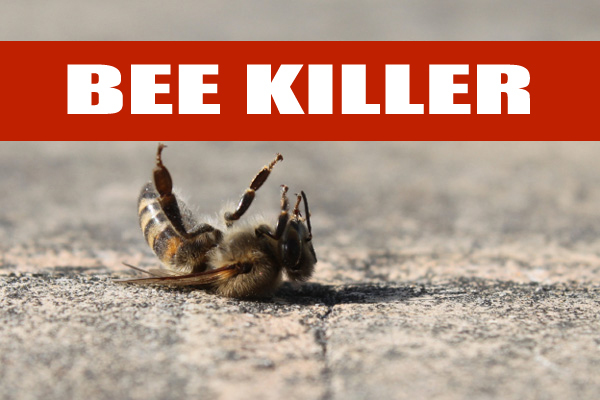 This latest study is not the first to link glyphosate to the vanishing honeybee. Glyphosate chelates minerals, lowers nutrients in plants: In CCD, Malnutrition is universally present. Glyphosate acts like an antibiotic to beneficial bacteria: In CCD, loss of Lactobacillus and other critical beneficial bacteria for digestion is commonly observed. Glyphosate is a neurotoxin: In CCD, honeybees experience neurological changes associated with disorientation. Gyphosate causes endocrine hormone & immune disruption: In CCD, immunity and other hormonal variables are altered or suppressed. Glyphosate stimulates fungal overgrowth: In CCD, the fungal pathogen Nosema increases. Glyphosate persists and accumulates: High environmental exposure, including glyphosate residues present in honey, nectar and other plant products, make honeybees susceptible to continual toxic challenge -- which is believed to be a primary underlying cause of CCD. It should be pointed out that the last factor listed – infectious organisms – are likely more a symptom than a cause of honeybee morbidity and mortality. In other words, following electromagnetic, agrochemical and dietary assault, the immune system of the honeybee – and the collective immunity of the hive – weakens, leading to greater susceptibility to opportunistic infections. One USDA study published in 2013 discussed the role of fungicidal contaminants in pollen leading to increased probability of Nosema fungal infection in bees who consumed pollen with a higher fungicide load. This linkage between chemical exposure > immune suppression, > opportunistic infection, is especially poignant when it comes to Roundup herbicide, which profoundly alters the makeup of the beneficial flora in exposed organisms, leading to the overgrowth of pathogenic bacteria. A 2012 PloS study found that lactic acid bacteria living in the crop (the part of the bee's alimentary canal that stores food prior to digestion) of bees are vitally important for the health of honeybees, with some strains suggesting a history of association with bees stretching over 80,000,000 years ago. Various chemical are capable of damaging this vitally important locus for the honeybee's immunity and digestion, and are likely exerting their adverse effects through sublethal, hard to detect mechanisms. Why Does Monsanto Own Beelogics, 'The Guardian of Bee Health Worldwide'? On Sept. 28th, 2011, Monsanto announced that it was acquiring the company Beeologics, whose explicit goal is to become "the guardian of the bee health wordwide," including finding ways to address CCD. "Beeologics LLC is an international firm dedicated to restoring bee health and protecting the future of honey bee pollination. Beeologics' mission is to become the guardian of bee health worldwide. Through continuous research, scientific innovation, and a focus on applicable solutions, Beeologics is developing a line of RNAi-based products to specifically address the long-term well being of honey bees, including the control of parasites and how they're involved in Colony Collapse Disorder (CCD)." A classical problem-solution approach, Monsanto creates a problem – a systemic herbicide intended to 'save the world' from hunger as part of its GMO Roundup-ready proprietary production system that actually destroys the pollinators required to maintain our global food supply – and then capitalizes on a GM solution on the backend, with patented RNA interference 'solutions' intended to, again, 'save the world' from hunger.